Early in my career I was at a dinner with coworkers celebrating the successful wrap of a project. I noticed the art director started swirling her wine in its glass, and then a few others did the same. I was a little worried about being seen as an unsophisticated berk, and thought to just start swirling mine, too. Instead, I took the risk and decided it would be better to ask. After I did, she explained it’s about aerating the wine, releasing its full flavor and aroma. She got excited about explaining it, and segued to stories about her wine tasting classes. I was able to do a taste test then and there between pre- and post-swirled Merlot. Next thing I knew she actually toasted me to the table for having the guts to ask what most would have considered an embarrassing question. She got to be the expert, I learned something pretty interesting, and I went up in her estimation. I can thank Richard Wurman for this memory. In undergraduate I came across a book of his that changed my worldview such that I’m able to ask those kinds of questions. I incorporated the lessons of the book so deeply (and so long ago) that I don’t even think about it much any more, but through some conversations with Cooper friend Anese Cavanaugh this year, I was reminded that this perspective doesn’t come easily or naturally. It’s something you have to learn deliberately, and it bears repeating. A weekday edition of The New York Times contains more information than the average person was likely come across in a lifetime of seventeenth-century England. Another quote down on the page reads, “Today, the English language contains roughly 500,000 usable words, five times more than during the time of Shakespeare.” These were mind-blowing notions of what it meant to live in the western world in the Information Age. Note that the original version of this book was written at a time when the Internet was still in diapers. Most people hadn’t heard of it yet. Now most of the readers of this blog carry a connection to the Internet in their pocket, I suspect the problem is much, much worse now. Wurman goes on in the book to discuss that with the explosion of information technology there has been a commensurate explosion of information. There’s more than any one person can hope to even be passingly familiar with. The problem is made worse by what Eli Pariser has called “filter bubbles” on news sites like Reddit or filtered sharing sites like Facebook. With more and more access to information, we’re hearing less and less of it. Given this glut of pre-filtered information, it’s ludicrous to expect that any one of us knows everything, or even a significant portion of things. And yet time and time again we run into people who will casually mention an article in a magazine, or a news event, or some movie, and if you say you’re not familiar with it, will utter an incredulous, “What? You don’t know about that? ?” The implication is of course that you should, and you’re somehow not living up to even hygienic levels of human awareness that you don’t. 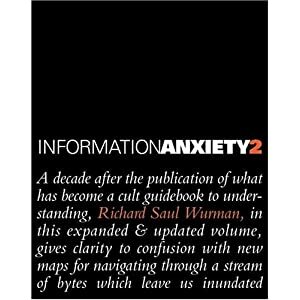 Wurman calls this information anxiety: the fear that you’re going to come across some information that you think you should already know. Having the anxiety can put you into some bad habits. Like pretending that of course you already do know what they’re talking about (and then piteously scrambling to cover your ignorance as the conversation continues), or making stuff up like a know-it-all, or attempting desperate (and likely obvious) conversational bids to shift the topic to something that you are familiar with. But once you acknowledge that we’re swimming in information, it lets you off the hook for not drinking the same parts as anyone else. That realization is powerful. So what do you do with this realization? What happens when you decide to stop tallying Who-Knows-What-When? In Cooper U classes we advise participants to adopt an “apprentice mindset” during research; an attitude of curiosity with a default posture of “show me” or even “teach me.” (We sometimes even encourage a little deliberate naivete to help check assumptions.) This mindset isn’t just useful in research. It’s the mindset you can adopt in everyday conversations with friends, family, and colleagues to help you get over your own information anxiety. To adopt it, you first need to stop doing two things. The first is of course to try and stop feeling the anxiety yourself. When you hear something that you don’t know but that the other person presumes you do, remind yourself that you’re a good person who does their best and who lives in the same information glut. Remind yourself it’s OK to not know everything. Think of this picture. It’s a visualization of the Internet by the Opte project, and remind yourself that this is just the stuff we choose to internet-ify. Even it’s just a small part of what you could know. There’s nothing long-term to gain by playing the game since trying to know everything is a fool's errand. Second, stop being the perpetrator of that incredulous tone yourself. Honestly, it’s just making you look like a douchebag anyway. * Stop judging others for not knowing your stuff like you do. It’s no surprise that your colleague or client hasn’t heard of that term-of-industry, or didn’t understand your wireframes, or doesn’t know what Fitts’ Law is. Rather than an opportunity to judge, treat it as an opportunity to share something awesome, to be a source of cool information, to improve your standing in their eyes, like that art director did for me years ago. It’s not just wine of course. It’s also asking after unfamiliar words. Having the guts to confidently and calmly pause conversations to make sure you understand what was just said, even if your boss is sitting right there. Even confessing that you don’t really watch Game of Thrones and had to look that earlier joke up. It’s all part of getting rid of your information anxiety and adopting an apprentice mindset in relation to the world. There’s a risk, sure. That someone who’s still suffering from the anxiety will think you’re stupid or out of touch. Personally I just don’t let it bother me and make a mental note that that person is still in the game and to be avoided. Or maybe to be sure and model the more functional behavior. And of course someone can take it too far. This shouldn’t mean you can just let go of knowing anything. It’s not moron pride. If anything, using these techniques put you in a position of learning more, more explicitly, and with less anxiety. And I’ll bet most of us can use less anxiety in our lives.